Please give a warm welcome to AE Jones who is joining us with her paranormal romance, MIND SWEEPER! First of all, I want to thank you for inviting me to Reading Between the Wines. And I have to confess right away, that Kyle, the heroine in my Mind Sweeper series, is a beer drinker. Great Lakes Dortmunder to be exact. Hopefully after that confession, you will still let me stay….okay?….good! So my confession got me thinking about how characters are revealed to us (the reader) in a variety of ways. Whether right or not, what someone eats or drinks paints a picture of them. Wine connoisseur vs. beer drinker. Tofu eater vs. BBQ junkie. And these supporting details can be used to make a character multi-dimensional. Here is a fun fact. Many writers develop trait sheets before they write their story. And in doing this, it fleshes out the character. Interesting, right? So what kinds of things are on these sheets? Well, there are the obvious questions like age, looks, clothing, job, living arrangements, etc. But there are other questions as well. What does your character drive? What does your character eat, drink? What music does your character listen to? Are they an early morning or late night person? Do they have money, or are they struggling to survive? Do they read? Watch TV? Movies? Do they like technology or are they technophobes? And the list can go on and on and change depending on what types of books you write. Questions a historical writer might ask are not the same ones that a paranormal author might ask. Think of it as questions that you would ask on a date. Questions that help you get to know the person. The author’s job is to share these tidbits of information in a way that draws the reader into the story. Really good books equate to really good characters that become our friends. So let me give you a couple of tidbits about Kyle as an example…you already know she is a beer drinker and she is definitely a carnivore. Can’t cook worth a darn, but lives in an apartment in Cleveland’s Little Italy and has all of the restaurants on her speed dial. Jeans, graphic T’s and work boots are her normal work outfits. And she doesn’t carry a purse. Getting a picture yet? Oh yeah, she likes to color her hair as the mood strikes her. So from that description, you can probably start to guess a little about Kyle’s personality. She is very outspoken (which is a nice way of saying she is a smart mouth) and doesn’t necessarily fit in with the nine-to-five crowd. Which is okay, since she doesn’t think she fits in with humans in general. But she also is not predictable. Kyle takes in a stray cat that she names Booger. And even though she grumbles each day while doing it, she brings pastries to her demon partner. And she loves romances, but she hides them under her bed. Those are the details that make me and hopefully you, the reader, smile. Because as my characters develop, they surprise me. And like a real person they don’t want to be pigeon-holed. Well rounded characters become the writer’s and the reader’s friend. And that brings each of us back for more stories! An angel, a demon and a vampire walk into a bar. Sounds like the beginning of a bad joke, but it's just another day in the life of Kyle McKinley. 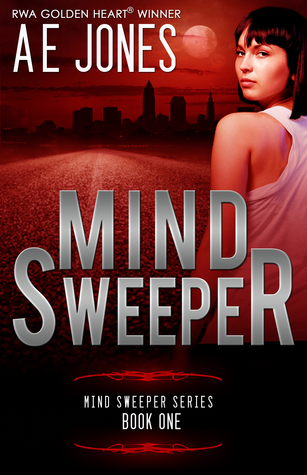 The author is giving away one digital copy of MIND SWEEPER to one reader today. To enter, please leave a meaningful comment for the author on this post and then fill out the rafflecopter below. Good luck! Fun post AE. I have to fight the urge to make all my characters drink chardonnay and Coke Zero like I do. ;) And you're right, it's those small details that make them real to readers. Happy release week to MINDSWEEPER! So true! Kyle is a carnivore to the core and I am not, so it seemed 'weird' to me to write about her eating hamburgers! Hah! But all these little nuances make a difference in relating the character to the reader. Yep, the more specific the details for me, the more real the character becomes! I have a sneaking suspicion you are going to like Kyle too. Can't wait to get my hands on your stories too! congrats to AE on the new release! This looks and sounds great! What is the one thing that you have to have/do while writing? It's the every day aspects of a character that can make them very relateable. I don't know if I have one specific thing I have to do. I can write sitting at a desk or with my laptop (and cat LOL) on my lap. I do usually write when it is quiet. I am not a writer who needs music in the background. I guess when I first sit down I think about the previous scene and where the next one will take me. I am not a plotter, so much as a pantser (write by the seat of my pants). Absolutely. I love when a quirk or habit that a character has makes us like them all the more! Hello! So excited you are reading my book! Yep, the little things develop the character so that they become multidimensional. The details you use make the characters jump off the page. Thanks so much! I'm glad you are enjoying it. I love the little details since they make my characters come to life for me! Love the post! Can't wait to read Kyle's story. And she has a demon partner. What fun! As you can probably guess, a lot of my characters drink Prosecco! Which is flowing in your honor because of your book birthday! Drink whatever you would like to celebrate my book birthday! Thanks for stopping by and I hope you like Mind Sweeper!